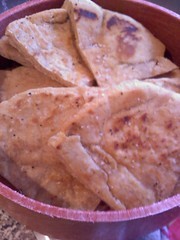 Naan is a common flat bread in Southeast and Central Asia. It reminds me a very soft pita bread without a pocket. I’ve learned to make this delicious bread in a snap using five minute canola oil artisan dough. I love this easy recipe because I mix it in a shoe box and let it rise on my counter for two hours. Then I stick it in my fridge and make all kinds of fresh, delicious bread whenever I want. 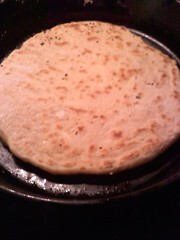 I love this naan because it’s so easy. This is just as easy as making grilled garlic bread once your dough is ready in the fridge waiting. First I preheat my skillet on medium for about five minutes. 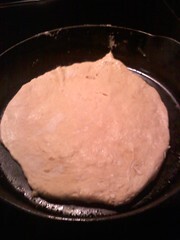 I take a plum size amount of dough and roll it into a circle which is the size of my cast iron skillet. I dust it with flour as I’m working with the dough to keep it from sticking. I roll or pat with floured hands on a silpat mat, but wax/parchment paper dusted with flour will work too. The secret to keep it from sticking is to make sure it’s well dusted with flour BEFORE you roll it out and lift up the circle and dust underneath if it’s sticking. 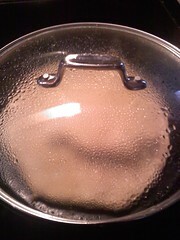 Gently lay the dough inside a lightly oiled skillet. Make sure you have a lid to fit. Cover and cook about two to three minutes per side. Be sure to check it if you smell it browning. Remove cover. It will look puffy. Flip with tongs and cook for another one to two minutes. If you want it as a side of bread remove to a cooling rack and brush with olive oil or melted butter and sprinkle with garlic salt. I cut mine into quarters with a pizza wheel and place them in my tortilla holder to keep warm while we’re grilling something tasty, like Italian chicken. This is wonderful with Italian chicken and greek salad. It’s a great bread for fish, chicken, beef or pasta. We love it as a base for greek chicken pizza. I always make extra grilled convenience chicken when we grill. 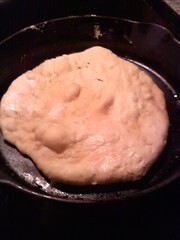 Kids like naan because it can be prepared as a personal pan pizza. I freeze whole naan by wrapping them in labeled foil and slip them into a gallon size freezer bag. 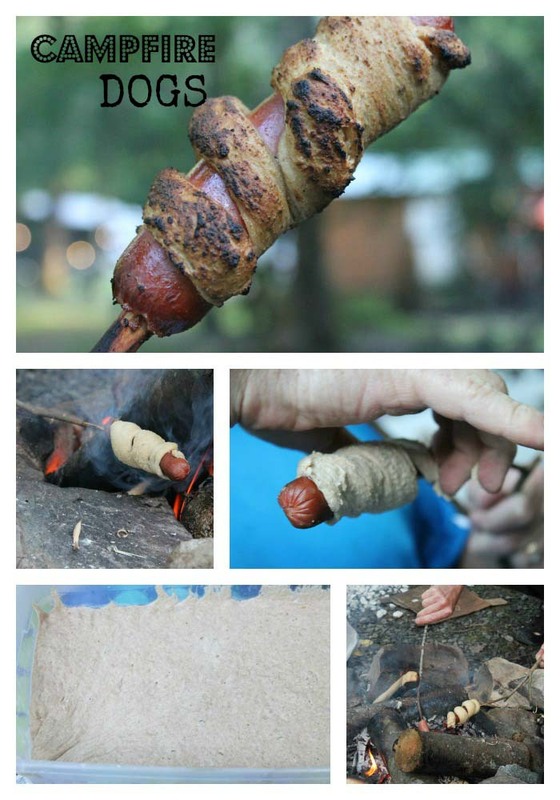 We take these on camping trips and throw them on the outdoor grill with our pizza toppings and serve it with a salad. Refer to the Artisan Dough 101 post to see a dough tutorial and the variety of other items you can make with this dough. Soft, delicious Naan or Indian Flatbread suitable for sandwiches, gyros, pizza, wraps, hummus, cheese and other dips. Pour the liquid ingredients into a 6 quart plastic shoe box. Measure and add the dry ingredients. Mix well using a heavy duty spoon until there are no dry patches. Cover with lid and allow it to rest at room temperature for two hours. Refrigerate the dough or roll and make into flatbread right away or use it within 5 days. Roll a plum size portion on a floured surface and place in preheated medium-low cast iron skillet with a lid. Cook for approximately two minutes per side until lightly toasted. 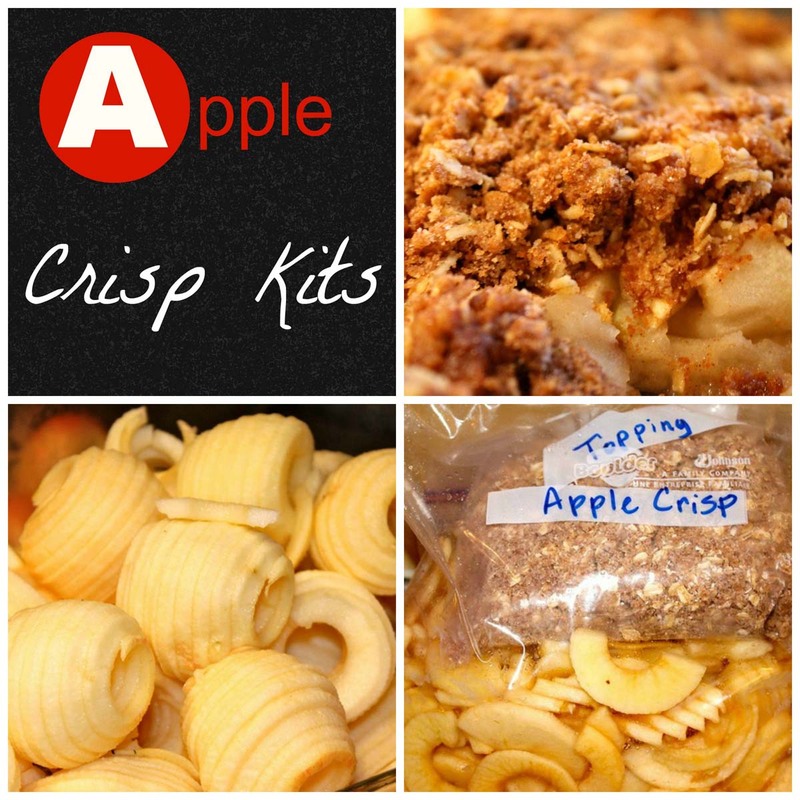 Would you believe I often double this recipe and make over two dozen and freeze them? I suggest doing this once you get the hang of it and see whether your family loves them like mine. You’ll have plenty to be creative with and give away. Enjoy your naan. How will you serve your flatbread? 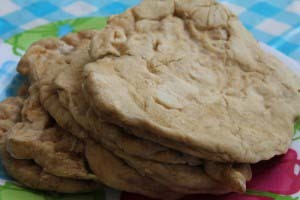 This entry was posted in Quick + Yeast Breads and tagged Homemade naan, how to make naan, Indian flatbread on 06.04.2011 by admin. I am making the naan for the first time, and I mixed it up in my Bosch mixer, but when it was done, it is still super wet and sticky. Did I do something wrong? or is this how it is supposed to look? That’s the only picture I don’t see with the recipe, what it looks like after mixed. Thanks. Mine was the same, completely wet and sticky. In the crockpot, our pizza was burned but the inside doesn’t seem to be quite done. And I made the whole batch so we seem to be out tons of flour. There was no possible way to roll this out and it was sticking to everything. It was like Gak. What gives??? I did add a lot more flour, but it didn’t seem to make much of a difference. Hmm… I ended up just putting it in the crockpot and cooking the rest of it like that. It’s in the freezer. I figure that I can use it for something some day. I only use it when I’m doing 100% white whole wheat. It will work w/o it if it’s half ww and half all-purpose. Will is work if I use All Purpose flour that has been bleached? Bleached flour does certainly work, but I prefer unbleached. You may not need as much water. I find it works better if you let it rest two hours and even better if you refrigerate it overnight. 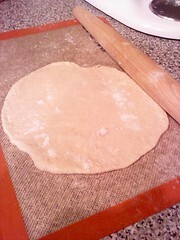 I then put flour on the slip mat when I roll it out and sprinkle a little more on each piece of dough. I do not use vital wheat gluten when doing half and half and it turns out great. Made an entire batch tonight going to freeze half and enjoy the other half with the Italian Chicken.